Background: Zingiber zerumbet locally known as lempoyang is used traditionally to cure swelling, sores, and loss of appetite. Its rhizomes contain many active compounds such as zerumbone and kaempferol that have been shown to exhibit antiproliferative activities on various cancer cell types. However, the effect of this plant on leukemia has not thoroughly been investigated. Objective: This study was conducted to investigate the cytotoxic effects of Z. zerumbet ethyl acetate crude extract on apoptosis-resistant erythroleukemia cell line, K-562. 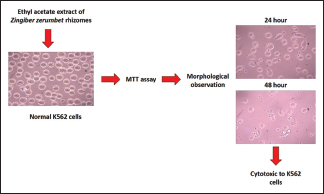 Materials and Methods: The cytotoxic effects and morphological changes of Z. zerumbet ethyl acetate crude extract on apoptosis-resistant erythroleukemia cell line, K-562, were investigated spectrometrically through 3-(4,5-dimethylthiazol-2-yl)-2,5-diphenyl tetrazolium bromide (MTT) assay and morphologically using the phase-contrast microscopy, respectively. Results: MTT assay demonstrated that this crude extract showed cytotoxic effects on erythroleukemia cell line K-562 in a dose-dependent and time-dependent manner with IC50values of 13.83 ± 1.82 and 10.13 ± 1.67 μg/ml for 48 and 72 h time points, respectively. The morphology of treated cells showed apparent changes of features such as membrane blebbing, cell shrinkage, and formation of apoptotic bodies which were the signs of apoptosis. The changes of cell morphology that resembled apoptotic features were more obvious with increase in treatment time. Conclusions: This finding indicates that ethyl acetate crude extract of Z. zerumbet exhibits cytotoxic effects on K-562 cell line through induction of apoptosis as morphologically seen in the cells. Further investigations are needed to ascertain the possibility of apoptosis as its major event of cell death. Abbreviations used: MTT: 3-(4,5-Dimethylthiazol-2-yI)-2,5-diphenyl tetrazolium bromide; DMSO: Dimethylsulfoxide; h: Hour. The ethyl acetate crude extract of Zingiber zerumbet exhibits cytotoxic effects on K-562 cell line through induction of apoptosis as morphologically seen in K-562 cells. Leukemia is a blood cancer which is characterized by accumulation of malignant white blood cell in blood and bone marrow. Chronic leukemia is a clonal myeloproliferative disorder affecting myeloid, monocytic, erythroid, megakaryocytic, B-cell, and occasionally T-cell lineages. Chemotherapy, tyrosine kinase inhibitor targeted therapy, biological therapy, and stem cell transplantation are among the treatments of chronic phase of chronic myeloid leukemia. However, most of the treatment caused side effects in the long term, and they do not have a fixed time frame of administration. Chemotherapy cannot cure leukemia, and it is only through transplantation of bone marrow from siblings with human leukocyte antigen compatible that the disease may be cured. Therefore, the new compound from natural sources which can kill leukemic cells without causing harmful effect to normal cells is much needed to develop a safety treatment for leukemia. Zingiber zerumbet Smith is a wild ginger known as lempoyang by locals in Malaysia. This plant belongs to the Zingiberaceae family, which widely grows and is cultivated in Southeast Asia for medicinal purposes. Conventionally, it is used to treat stomach aches and wounds, relieve headaches, and increase appetite. The major active compound present in Z. zerumbet is zerumbone. Kirana et al. discovered that zerumbone is effective as an anticancer agent through the stimulation of apoptosis and antiproliferation effects. Studies have shown that zerumbone can also act as antileukemic drugs by inhibiting the growth of leukemia cells through cytotoxic effects and continuous induction of apoptosis toward leukemic cells. Previous studies also found that zerumbone showed cytotoxic effects on leukemia cell line K-562. Kaempferol, one of the active compounds isolated from this plant, has been found to increase the effect of cisplatin by promoting the formation of apoptosis in ovarian cancer cells. Kaempferol and quercetin are believed to provide synergistic effect in reducing breast cancer cell division. Therefore, a combination of these active compounds that might be present in the ethyl acetate extract of the rhizome has to be studied to identify its effectiveness as cytotoxic inducing agent through the changes in morphology of the cell. Therefore, the objectives of this study were to determine the cytotoxic effect and morphological changes of Z. zerumbet ethyl acetate crude extract on leukemia cell line K-562 using 3-(4,5-dimethylthiazol-2-yl)-2,5-diphenyl tetrazolium bromide (MTT) assay and phase-contrast microscopy. Rhizomes of Z. zerumbet (voucher specimen UKMB-29952 deposited in the herbarium of the Faculty of Science and Technology, UKM) were obtained from a herbal farm in Temerloh, Pahang. The rhizomes were extracted using ethyl acetate extraction. Stocks from extract solution were prepared by dissolving the 2 mg of extract Z. zerumbet with 1 ml dimethylsulfoxide (DMSO) to produce 2 mg/ml of stock concentration. Eagle's minimum essential medium, Dulbecco's modified Eagle's medium, Iscove's modified Dulbecco's medium, solution of MTT, phosphate buffer saline, trypsin/ethylenediaminetetraacetic acid 0.25%, and doxorubicin hydrochloride were used in this study. Cell line used is K-562 leukemia cells (erythroleukemia) obtained from the American Type Culture Collection. Cells were cultured in Biocompatibility and Toxicology Laboratory, Faculty of Health Sciences, Universiti Kebangsaan Malaysia, Kuala Lumpur Campus. Z. zerumbet rhizomes that had been dried were immersed in hexane for 3 days at room temperature. The extract obtained was then filtered to separate the extractant from the rhizomes. Filtrate used was hexane and the immersion process was performed three times for the same solvent. This extraction process was repeated with ethyl acetate to yield ethyl acetate extract. Rotary evaporator was used to separate the solvent from the extract samples, thus producing the concentrated extract. Cell viability for K-562 leukemia cells was determined using MTT assay by Mosmann's method. All cells were treated with the extract of Z. zerumbet and doxorubicin (positive control), based on their exposure to time point, respectively. After the incubation period, 20 μl of MTT solution was added into each well and incubated for 4 h at 37°C. After that, 200 μl of the solution was removed from each well without disturbing the formazan crystals formed in the bottom of the 96-well plate. Then, 180 μl DMSO was added to each well to dissolve the formazan crystals and incubated again for 15 min. The absorbance was determined by ELISA plate reader at 570 nm. The IC50 was obtained from the viability curves and assessed as the concentration that reduces the percentage of viability of cell to 50% as compared to controls. The level of toxicity of the extract can be classified into four categories based on IC50 toxicity cell viability value according to How et al. K-562 cell was cultured in 6-well plates treated with IC50 concentrations of extracts and doxorubicin for 24 and 48 h. Then, the observation of morphology was done using phase-contrast microscopy. The results were analyzed statistically and are expressed by means ± standard error of mean using SPSS version 17 (IBM Corporation, Chicago, United States), while the morphological changes were analyzed descriptively. 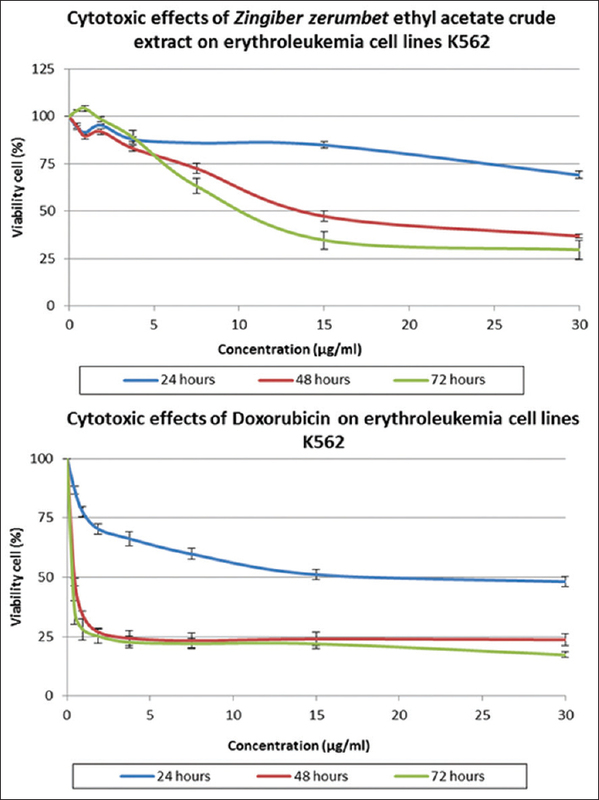 When comparing the potential of the combination of various active compounds in this extract on K-562 erythroleukemia cell line with pure compound zerumbone as shown by Asmah et al., the IC50 value of K-562 cells treated with crude extract of Z. zerumbet is 10.133 ± 1.665 μg/ml, while the IC50 for cells treated with zerumbone is 9.72 ± 0.076 μg/ml. Both IC50 values for these two studies showed an almost similar value. Therefore, it can be concluded that the crude extract of Z. zerumbet was able to give almost the same cytotoxic effect as the main active compound found in this plant, zerumbone, at almost the same concentration. This is because the rhizomes of Z. zerumbet contained high concentration of zerumbone that can inhibit the growth of leukemia cells by cytotoxic effects and followed by apoptosis induction. For the K-562 cells treated with Z. zerumbet extract, the morphological changes can clearly be seen such as cell shrinkage (yellow arrows), membrane blebbing (red arrows), and formation of apoptotic bodies (blue arrows) which are the characteristics of apoptosis [Figure 2]. While cells treated with doxorubicin showed cell shrinkage and some cells showed swelling (green arrows), which is an early sign of necrosis. Meanwhile, in the case of the cells treated with doxorubicin, the number of cells observed decreased rapidly and morphological characteristics such as cell shrinkage and membrane blebbing were also observed. 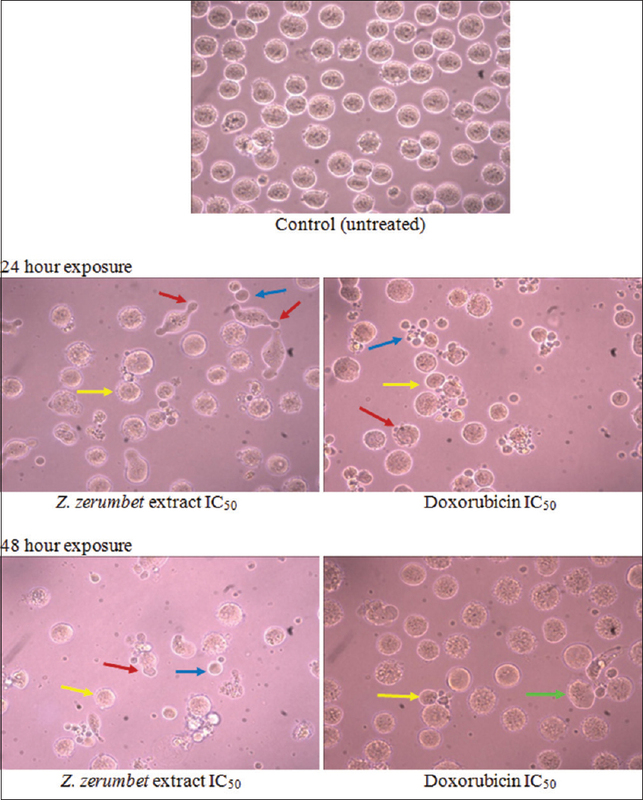 This study reveals that Z. zerumbet ethyl acetate extract exhibited cytotoxic effect, which is in a less toxic category on erythroleukemia cell line K-562. Based on the morphological changes, Z. zerumbet ethyl acetate extract induced apoptosis-related morphological changes on apoptosis-resistant K-562 cells as an event of cytotoxicity. Therefore, further studies are needed to ascertain its mechanism of action and its potential as antileukemia agent. This work was financially funded by Ministry of Education Fundamental Research Grant Scheme (UKM-NN-07-FRGS-0152-2010). Hoffbrand AV, Moss PA, Pettit JE. Essential Hematology. 5th ed. Oxford: Blackwell Publishing Limited; 2006. Atallah E, Talpaz M, O'brien S, Rios MB, Guo JQ, Arlinghaus R, et al. Chronic myelogenous leukemia in T cell lymphoid blastic phase achieving durable complete cytogenetic and molecular remission with imatinib mesylate (STI571; gleevec) therapy. Cancer 2002;94:2996-9. National Cancer Institute; 2007. Cancer Drug Information: Doxorubicin Hydrochloride. Available from: http://www.cancer.gov/cancertopics/druginfo/doxorubicinhydrochloride. [Last accessed on 2011 Apr 26]. Bell A, Sallah S. The Morphology of Human Blood Cells.7th ed. United State: Abbott Laboratories; 2005. Holttum RE. The Zingiberaceae of the Malay Peninsula. Gardening Bull Singap 1950;13:1-249. Somchit NM, Nur Shukriyah MH. Anti-inflammatory property of ethanol and water extracts of Zingiber zerumbet . Indian J Pharmacol 2003;35:181-2. Matthes HW, Lvu B, Ourisson G. Cytotoxic components of Zingiber zerumbet , Curucuma zedoarza and C . domestica . Phytochemistry 1980;19:2643-50. Kirana C, McIntosh GH, Record IR, Jones GP. Antitumor activity of extract of zingiber aromaticum and its bioactive sesquiterpenoid zerumbone. Nutr Cancer 2003;45:218-25. Asmah H, Ali AM, Rajab N, Alitheen NB, Hasnah S, Bakar AA. Zerumbone causes morphological changes on different types of leukemic cell lines. J Microsc Soc Thai 2007;21:126-30. Asmah H, Ali AM, Rajab N, Alitheen NB, Hasnah S. Cytotoxic Effect of Zerumbone on Leukemic Cell Lines. 6th National Symposium on Health Sciences; 2006. p. 57-66. Luo H, Daddysman MK, Rankin GO, Jiang BH, Chen YC. Kaempferol enhances cisplatin's effect on ovarian cancer cells through promoting apoptosis caused by down regulation of cMyc. Cancer Cell Int 2010;10:16. Ackland ML, van de Waarsenburg S, Jones R. Synergistic antiproliferative action of the flavonols quercetin and kaempferol in cultured human cancer cell lines. In Vivo 2005;19:69-76. How FN, Crouse KA, Tahir MI, Tarafder MT, Cowley AR. Synthesis, characterization and biological studies of S-benzyl-B-N-(benzoyl) dithiocarbazate and its metal complexes. Polyhedron 2008;27:3325-9. Murakami A, Takahashi D, Kinoshita T, Koshimizu K, Kim HW, Yoshihiro A, et al. Zerumbone, a Southeast Asian ginger sesquiterpene, markedly suppresses free radical generation, proinflammatory protein production, and cancer cell proliferation accompanied by apoptosis: The alpha, beta-unsaturated carbonyl group is a prerequisite. Carcinogenesis 2002;23:795-802. Tanaka T, Shimizu M, Kohno H, Yoshitani S, Tsukio Y, Murakami A, et al. Chemoprevention of azoxymethane-induced rat aberrant crypt foci by dietary zerumbone isolated from Zingiber zerumbet . Life Sci 2001;69:1935-45. Huang GC, Chien TY, Chen LG, Wang CC. Antitumor effects of zerumbone from Zingiber zerumbet in P-388D1 cells in vitro and in vivo . Planta Med 2005;71:219-24. Norfazlina MN, Farida Zuraina MY, Rajab NF, Mohd Nazip S, Rumiza AR, Zaila S, et al . Cytotoxicity study of Nigella sativa and Zingiber zerumbet extracts, thymoquinone and zerumbone isolated on human myeloid leukemia (HL60) cell. Open Conf Proc J 2013;4:99-107. Chane-Ming J, Vera R, Chalchat JC. Chemical composition of the essential oil from rhizomes, leaves and flowers of Zingiber zerumbet smith from Reunion Island. J Essent Oil Res 2003;15:202-5. Sakinah SA, Handayani ST, Hawariah LP. Zerumbone induced apoptosis in liver cancer cells via modulation of Bax/Bcl-2 ratio. Cancer Cell Int 2007;7:4. Murakami A, Takahashi D, Kinoshita T, Koshimizu K, Kim HW, Yoshihiro A, et al. Zerumbone, a Southeast Asian ginger sesquiterpene, markedly suppresses free radical generation, proinflammatory protein production, and cancer cell proliferation accompanied by apoptosis: The alpha, beta-unsaturated carbonyl group is a prerequisite. Carcinogenesis 20002;23:795-802. Murakami A, Tanaka T, Lee JY, Surh YJ, Kim HW, Kawabata K, et al. Zerumbone, a sesquiterpene in subtropical ginger, suppresses skin tumor initiation and promotion stages in ICR mice. Int J Cancer 2004;110:481-90.